There was clearly space for an independent library mapping the libvirt API and XML schemas to GObject, which could then be used by any application. The task of creating a libvirt GObject library API is large enough, without considering the task of also ensuring it is accessible from all the non-C programming languages. Fortunately, with the release of GNOME-3, GObject introspection has now matured to the point where it can really be used in anger for real application development. The upshot is that it is now feasible to attempt development of a proper libvirt GObject API. libvirt-gib – non-object based glue code between GLib and libvirt. In particular this has APIs to convert libvirt virErrorPtr instances into GError instances, and provides an implementation of the libvirt event loop contract, using the GLib GMain APIs. 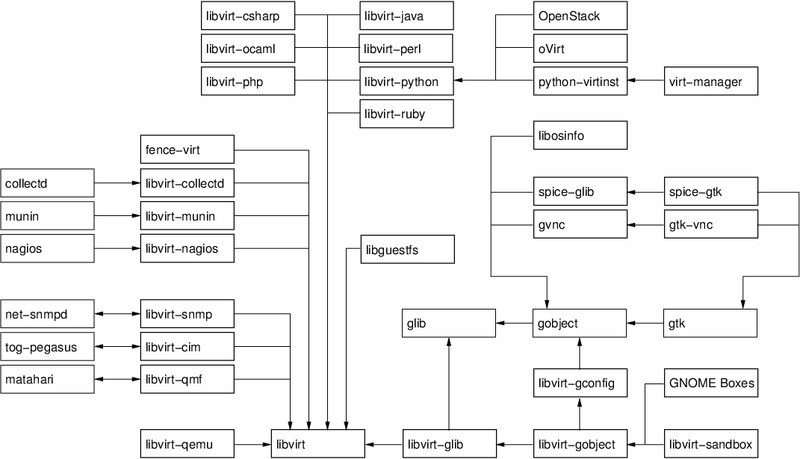 libvirt-gobject – object based APIs which map libvirt types and APIs into GObject classes. This library depends on libirt-glib and libvirt-gconfig, and is where the current virt-manager object mapping APIs will be replicated. This library is also adopting the GIO paradigm for allowing asynchronous API invocation & completion, for long running applications. This eliminates much of the need for applications to explicitly use threads (thread usage is hidden behind the async API impl). From day 1, all the APIs are being developed with GObject introspection in mind., so all methods are fully annotated, and we are generating the glue layer for Vala bindings as standard in order to support the GNOME Boxes application. It is still very early days for development and very little of the libvirt API has been mapped into GObject thus far and work is only just starting on the XML object mappings. The overall target, however, is to develop the library to the state where it can support the aforementioned GNOME Boxes application in Fedora 17, as well as an application sandbox framework I am developing for Fedora 17 (more on that in a later blog post).